Getting Kids Reading: Read to your child. Every day. Read to your child. Every day. It's the single most important thing you can do to get your kid reading. Statistics show that if you read to your child, every day, even for 10 minutes - it's likely that your child will grow up to become a reader. The New York Times recently published a heartwarming true-life story about a father who read to his daughter every night, without missing a single night. For more than nine years. It's a wonderful article about a single father who wanted to create a bond with his youngest daughter. He proposed "The Streak" - to see if they could read together for 100 straight bedtimes without skipping. "In those nine-plus years, they survived many close calls. When Kristen was still in elementary school, her father and older sister went to Washington. "The phone rings at 10:45 in the hotel and it's Kristen," Mr. Brozina recalled. "She says, 'Dad, we forgot The Streak!' Fortunately, I always travel with several books and we read right then and there." The Streak brought the pair much more than a love of reading. It brought them a shared language, taken from the pages of the Dr. Seuss and Dickens and Shakespeare books they read together. But more importantly, it was something they both could count on, through the hectic days. No matter what happened during the day, they knew where they would both be that evening. You can do this, too. Don't think of it as a nine-year streak. Think of it as - tonight I'm going to read with my kids. Just 10 minutes. Thank you to Jen Robinson, for bringing this story to my attention through your tweet. And to Michael Winerip for being "that" kind of journalist. 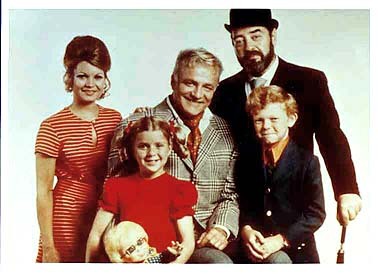 Bonus nonsense: Did you catch that I've used a picture from Family Affair, that great 1966 sitcom about a single dad bringing up two children (and of course featuring their butler, Mr. French)? If you look at the picture accompanying the New York Times article, you'll see why. I hope. Or maybe it's just me. Thanks to you, and Jen for prompting you. As a single dad, it is a story that warmed my heart, and I don't know what our current streak is, but we haven't missed many nights these last five years. That is so great. It really is far and away the most important thing you can do for a child in terms of their lifelong literacy.